Every item is hand painted, no stenciling or stamping! Roger Ensign, owner of Sunset Wineworks in Spring Lake, Michigan makes quality hand made, hand painted products for the home. 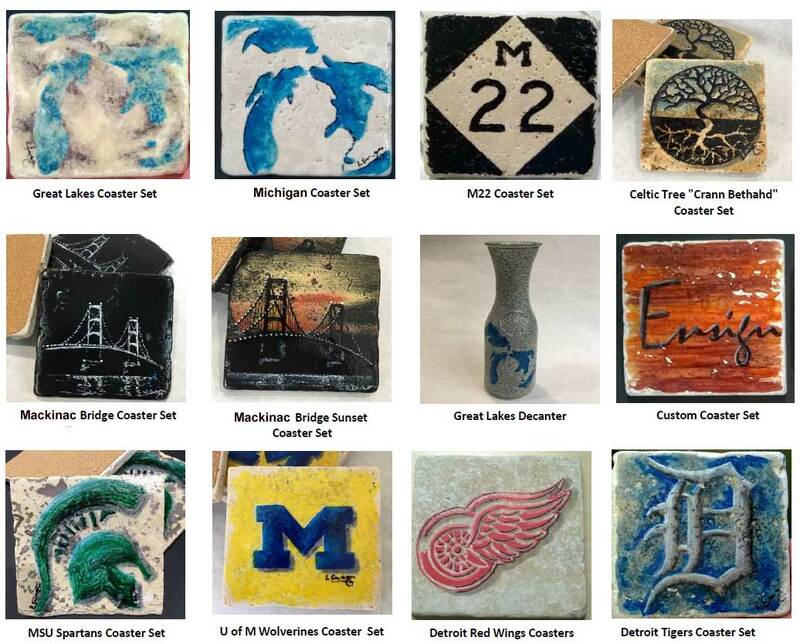 His primary product is travertine coasters with various themes including Michigan and the Great Lakes as well as sports and made-to-order. All pieces are individually hand painted and unique. The hand painted designs of the Coaster Sets are on Travertine Stone with a cork backing. No two coasters are identical as each coaster is hand painted and unique. The set of four coasters weigh approximately two pounds and each travertine coaster measures 4 x 4. Personalization and a variety of color schemes are available upon request. Also available are matching hand painted Decanters. The decanters are hand made and hand painted on a stone texture glass decanter. No two decanters will be identical as each decanter is hand painted and unique. The one liter capacity decanter measures approximately 12″ x 4″. Decanting helps the wine to open up. A typical reason to decant is to aerate the wine. Many young wines can be tight or closed on the nose or palate. As the wine is slowly poured from the bottle to the decanter it takes in oxygen, which helps open up the aromas and flavors. 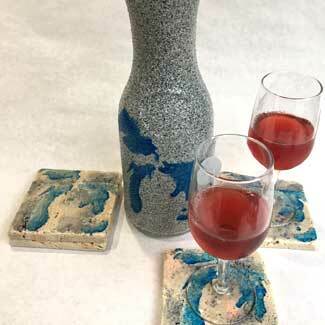 A matching Decanter and Coaster Set makes a great gift!